Great Lakes Seaway Trail, NY and PA - The Great Lakes Seaway Trail is a nationally-recognized authentic American road trip experience in New York and Pennsylvania. The not-for-profit Seaway Trail, Inc. is reinforcing the message that this National Scenic Byway is good for the Wayne County economy and local businesses with a new member incentive program. The 518-mile Great Lakes Seaway Trail connects such places as Pultneyville, Wolcott and Sodus Point with byway communities stretching along the St. Lawrence River, Lake Ontario, the Niagara River, and Lake Erie. Seaway Trail, Inc., with offices in Sackets Harbor and Webster, NY, has already brought more than $3.2 million in scenic byway grants for planning, interpretation and marketing of byway communities into the 11-county region. The latest Seaway Trail, Inc. travel and tourism initiatives include a host of War of 1812 Bicentennial plans, a Trailwide geocaching adventure, and an organized leisure walking program. More than 245 quilters, groups and history buffs from three nations have registered to participated in the March 17-18, 2012 Great Lakes Seaway Trail War of 1812 Bicentennial Quilt Show (www.seawaytrail.com/quilting). The event is expanding to three sites in the 1812 heritage community of Sackets Harbor, NY. The Great Lakes Seaway Trail GeoTrail - a high-tech treasure hunt with hand-held GPS units - produced $150,000 in economic impact in its first year and is expected to add another $250,000 in direct economic activity in byway communities over the coming years (www.seawaytrail.com/geotrail). The new Great LakesSeaweay Trail Volkssport Association is developing a series of 1812-themed walks to start in April 2012 (www.seawaytrail.com/volkssport). Seaway Trail, Inc.'s latest initiative to drive economic growth for local businesses is a new membership incentive campaign. Seaway Trail, Inc. and more than two dozen partners are announcing a full set of business-to-business discounts and incentives to encourage membership in the not-for-profit organization. Partners in the new campaign include AAA. Hertz Car Rental, Office Depot, printers, brochure distribution services, media and others. 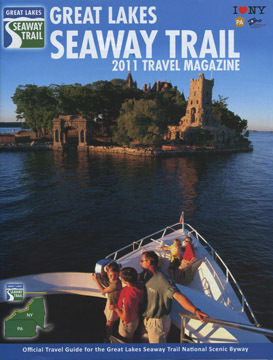 Seaway Trail, Inc. members will continue to benefit from inclusion in the annual Great Lakes Seaway Trail Travel Magazine with a distribution of 200,000 copies locally and outside the region (www.seawaytrail.com/travelmagazine). "This new membership campaign invites local businesses to discover new ways to attract customers, save money on common business expenses, and join their interests with a non-profit organization making a positive impact on the local economy," says Great Lakes Seaway Trail Director of Business Relations Kurt Schumacher. 0 Comments to " "